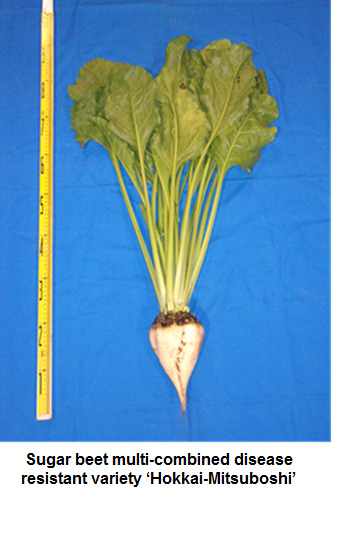 Sugar beet is an industrial crop that supports the sugar production, which is one of the most important industries in Hokkaido agriculture and indispensable for the development of local communities. Our ultimate goal is to develop a new variety that is able to be stable supply with high sugar content and high yield. However, in Hokkaido, due to it is high temperature and humid cultivation environment for sugar beet comparing to other countries, there are a lot of occurrence of disease damages such as "Cercospora Leaf Spot" and "Aphanomyces Root Rot" constantly. Hence it has brought large yield loss and reduction in the quality as raw materials. In addition, with the tendency of increasing cultivation area per farmer in relation to decreasing in number and aging of farmers, there is a high expectation for direct sowing cultivation of sugar beet which can promote labor-saving cultivation in the fields. We are aiming to develop DNA marker assisted breeding system for making new varieties. We have constructed applicable markers tightly linked strong disease resistance genes and QTLs, such as "Cercospora Leaf Spot" and "Aphanomyces Root Rot". Also, our cytoplasmic male sterility (CMS) with accumulated multiple disease resistances are promoting joint breeding collaboration with overseas seed companies in order to develop early superior varieties that combines high yield and disease resistance. Furthermore, we research and develop the identification of important genes involved in genetic mechanism of disease resistances, CMS and bolting tolerance in order to efficiently develop breeding materials. We also have started selecting resistant breeding materials for beet western yellow virus (BWYV), which is a new problem in recent years. For direct sowing cultivation, paying more attention to ensure the stabilization of germination and the vigor in early stage, we will select an adapting ecotype of cultivar for narrow row density. As a result so far, through international collaboration with Syngenta seeds in Sweden, we have developed variety "Hokkai-Mitsuboshi" (FY 2011) to labor-saving cultivation which has combined three strong disease resistances such as "Aphanomyces Root Rot", "Cercospora Leaf Spot" and "Rhizomania". We are also developing a promising variety "Hokkai no.104" with improved bolting tolerance and sugar content compared to "Hokkai-Mitsuboshi".